Compare two pictures and touch the spot that is different from each other. Each picture will have a total of 5 different spots. There is a time penalty for tapping the incorrect spot. Find all 5 spots in 5 different pictures in 60 seconds. You can link combos by finding the next different spot before the 'Combo Stage" runs out. Link Combos to increase your score or improve your chances at entering the Bonus Stage. You can earn game coins during the Bonus Stage. When you are having difficulties or running out of time. You can get help from game items. You can purchase these items with coins from the store. Power Booster items will help you increase your score. What is a heart? You need 1 heart to play a game. 1 heart is refilled every 15 minutes. 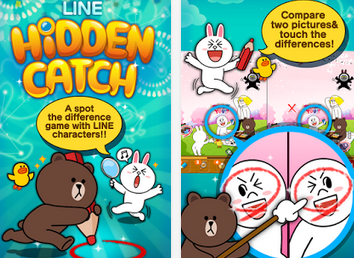 You can send 1 heart to each of your Line friends playing the game per every three hours. Go to the message Box to send messages to your Line friends and to check for hearts received. There are different ways to earn hearts. You receive 1 heart for inviting a Line friend to the game. You can also use Gems to purchase Hearts. You can purchase packs from the store or download for free. Please download all packs from online except for basic ones.